Employer: Any Employer Cordova Family YMCA Mow & Blow Lawn Service, LLC Playhouse on the Square / Circuit Playhouse, Inc.
Playhouse on the Square / Circuit Playhouse, Inc.
We are an established landscaping company seeking only hard working and motivated people with reliable transportation. Our company specializes in residential and commercial lawns. We are looking for experienced landscaping crew laborers and drivers. We offer overtime, paid vacation after one year, and weekly pay. Please apply on our website www.mowandblowlawnservice.com or call us at 901-410-3629. 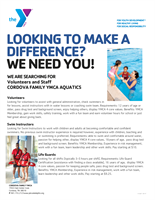 The Cordova Family YMCA is looking for Life Guards to fill all shifts of the day including weekends. Life Guard certification is recommended and we do offer assistance finding access to a class if certification is not currently held. We are looking for people that enjoy working with others, can fit into a fun and exciting team and want to learn something new everyday! To apply or for more information, please contact Julia Johnson at julia.johnson@ymcamemphis.org.